The international premiere of Anna Gawlita's short documentary "Horse Riders" has just took place at Ji.hlava Festival in Czech Republic. Take a minute and read our review. Witty and eye-catching observations from an annual horse pilgrimage in a Polish village near Opole become for Anna Gawlita a starting point for a small, black-and-white essay about the sacred and the profane. Krzyżoki - as we can read in the closing credits - is a "regional tradition, probably of the pagan origin, kept alive in the southern Poland. Each year on Easter Sunday a horse pilgrimage sets off from a church in the village of Sternalice near Opole. The pilgrims ask for good crop and protection from natural disasters". Gawlita's documentary picture can be read both ways: as an ethnographical impression depicting an important period for the villagers, and as a film exposing a man, faith and church; a film in which religious rites intertwine with ritual feast, food and alcohol. Step by step Gawlita describes the course of the holiday celebrations; each element, each action is equally important here: horses being loaded, prayers of the faithful, journey of the holy figure or the stops in the pilgrimage, when alcohol is generously passed around. There are not many words in this film, but the black-and-white frames by Tomasz Walski are like pictures captured in motion that record the reality in its key moment. There is something in this film that brings to mind Ślesicki and Karabasz - an ethnographic photograph of a man, an animal and nature; an admiration of movement, gesture and fleeting beauty. 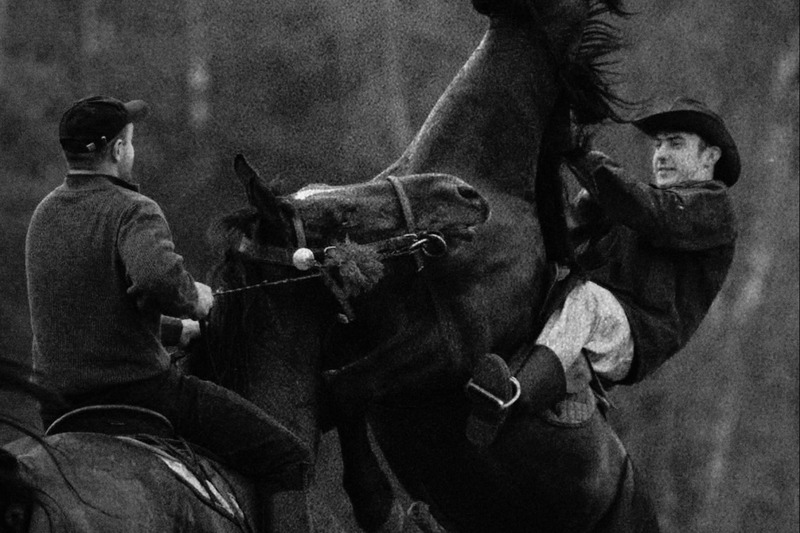 But in "Horse Riders" there is also something from Wiszniewski's films - the fascination with statues and building statuesque heroes from "ordinary" people. However, the air escapes from the statues built by Gawlita; the characters in "Horse Riders" rise and fall not only during the holiday, but also right there before our eyes, with all their belongings displayed in the background. Due to the precise editing, the character of the holiday is reflected in the entire film structure. Firstly, when the horses are being prepared to be transported, the screen "vibrates" with single, disturbed shots. In the last frame before the title, we look into the deep eyes of a defenceless horse. The animals in Gawlita's film are silent witnesses and victims of the human hypocrisy. When the horses are finally handed out to the pilgrims, the picture becomes dynamic: movements of the camera, the length and sequence of the shots, close plans, all that harmonises with the particular elements of the holiday celebration. Praying, horse riding around nearby households, zealous singing under the influence of alcohol - this visual chase is additionally complemented with close shots of a small figure of Resurrected Christ, which travels from one house to another, passed from hand to hand like a trophy. 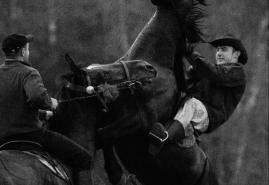 "Horse Riders" is one of the most interesting documentaries released in recent years. It is a film that is made of reality and before our eyes becomes a deep essay written with a camera.